Any drama fan may be familiar with that steamy shower scene featuring the hero deep in thought or perhaps breaking down in agony. It is a private emotional moment for the protagonist but a moment of serious ogling for the rest of us who stare at the hotness that is on screen. The thing is, wuxia series have been filming the same scene for decades often showing a closeup of the hero, heroine or both inside a giant tub of water. Now, this is not heading where you think it's going because the tub has many purposes, all of it platonic. I'm sure we've seen it many times before but what most of us are not privy to is what goes on inside the tub. 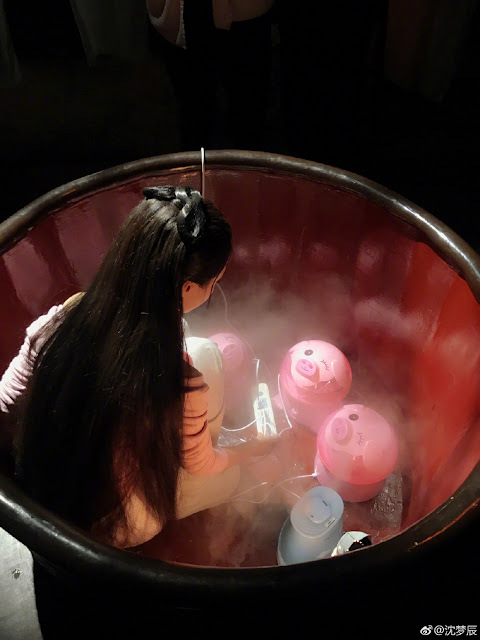 Actress Shen Meng Chen (Dragon Gate Inn) posted some pictures on weibo to bring us closer to the truth and we see her surrounded by three or four humidifiers, most of them in the shape of a giant piggy. She adds the caption, "Finally know why wuxia heroes close their eyes when practicing martial arts, if they don't close their eyes then they will easily laugh." Ha ha ha! Thanks for sharing. Thanks for sharing even if it kind of ruins the illusion. The fact that the humidifiers are piggy ones is killing me lol!